Mix Salt and Red Chilli Powder in a small bowl. Keep it aside. Take a bowl full of water and throw in the Slit potatoes. Allow it to boil vigourously for 10 mts. Pirce a Fork into a Piece and see whether its cooked properly. Transfer the cooked potatoes into a siever. Turn the stove to Min Fakme and allow it to fry for a minimum of 20 Mts. The time to fry depends on ones interest. 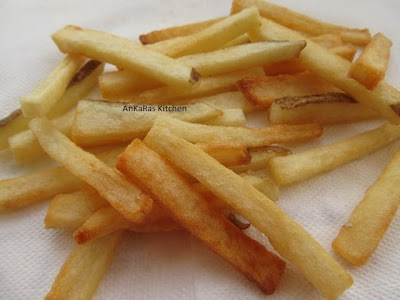 As my Hubby needs crispy Fries, i kept the potatoes in low flame for close to 30 mts.